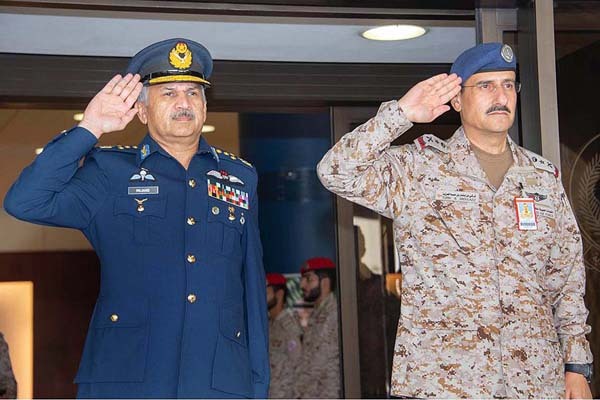 ISLAMABAD, Oct 23 (APP):Air Chief Marshal Mujahid Anwar Khan, Chief of the Air Staff, Pakistan Air Force has visited Headquarters of Royal Saudi Air Force during an official visit of Saudi Arabia. On his arrival, a smartly turned out contingent of Royal Saudi Air Force presented guard of honour to the Air Chief, said a press release issued here on Tuesday by Directorate of Media Affairs of PAF. During the visit, he met his counterpart, Lieutenant General (Staff) Turki bin Bandar bin Abdulaziz Al Saud, Commander Royal Saudi Air Force. While showing satisfaction on the current level of cooperation, both the dignitaries agreed to explore new avenues to further enhance bilateral cooperation.